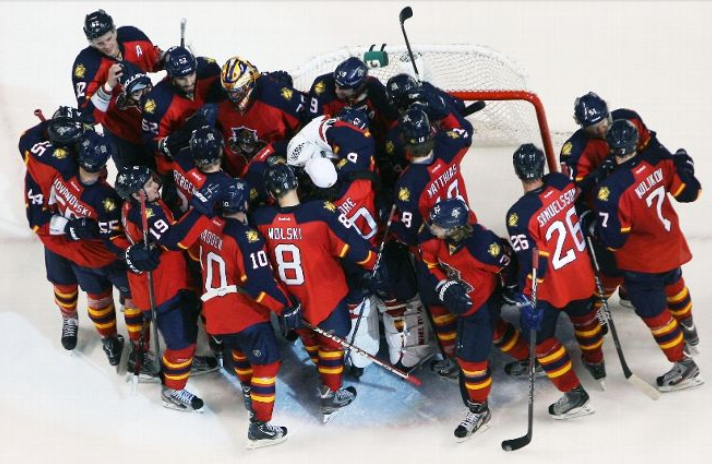 SUNRISE –After Florida’s 2-1 Saturday night shootout win over Boston courtesy of Roberto Luongo and Brandon Pirri, Panthers captain Willie Mitchell was asked what the young Panthers could possibly learn from the enormous moment at the BB&T Center. Frankly, there hadn’t been a moment like that since April 26, 2012, when Adam Henrique broke the hearts of the entire arena. And after a slow start by the Panthers – the first 15 minutes were very nervy ones by the home team – there were plenty of moments. The Cats settled in and battled the Bruins, desperately chipping away at a 5-point wildcard deficit in a game that was like a heavyweight match. In the second and third periods, the physical play reached a crescendo with the Panthers doing the majority of the smacking. The two expressions I heard most often in the Florida dressing room post-game from Gudbranson , Luongo and Pirri were the lack of space on the ice and the playoff-style energy to the contest. Gudbranson said the Panthers didn’t designate a must-get number of points in the three tilts versus the Bruins, the first of which went to Florida in a single-point gain. “Our playoffs started a long time ago. Knowing where we are in the standing in relation to Boston, it had to be tonight. It was a physical affair all night long. They brought it, we brought it. We’re really happy to come out on the top end,” Gudbranson said. Luongo said the crowd’s enthusiasm was palpable. He easily stopped Patrice Bergeron and Brad Marchand before Pirri slowly skated in and 5-holed Tuukka Rask. In his second start since returning from injury, Luongo said he had no history on Boston center Ryan Spooner, the Bruins’ last chance at prolonging the game. Florida improved to 8-10 in shootouts while Boston slipped to 3-9. Luongo has seen Pirri’s game-winning move on Rask, too. The Finnish goalie stopped Pirri in a 2-on-1 in overtime, then Pirri’s last blast of the 5-minute session whistled by the near post off a pass from Aleksander Barkov. “Rask made one huge save on him, and (Pirri) missed on another, but Pirri’s so good and patient with the puck in the shootout. I see it in practice every day. It’s a tough move to stop,” Luongo said. It wasn’t a perfect night for Florida. In fact, the scenario that played out was maybe third-best in the pecking order. Ottawa won over Toronto – whom the Senators play two more times – and Boston gained a point. As always, there were many near misses for the Cats, too, most noticeably Dave Bolland failing on a tap-in. The center had a chance to quiet the belly-aching over his acquisition, and his assist on Jimmy Hayes’ tally in the first was a beautiful backhanded pass. But he came up short on Rask’s doorstep in his efforts to be the game’s No. 1 star. ESPN had that save in its top 10 plays, but the result was more about Bolland whiffing than Rask stonewalling. Still, it was perhaps the best night of the year in Sunrise. A dramatic win over a tough opponent whom Florida has struggled against, all in the thick of a playoff race and played out in a front of a loud crowd. “We’re a good group in here, and we know where we are. There’s a very, very strong belief in here that we’re going to make the playoffs and go far in the playoffs once we get there. We’re just going to continue the way we’re going and stay strong,” Gudranson said. Florida did just that. They held strong, put pressure on Boston and won a game that felt like the postseason all over again — just with no Henrique ending. They stayed in what amounted to a very important moment. We’re only five games deep into the 2014-15 season, but the Florida Panthers have already given their fans some dire concern but with glimpses of hope, moments of worry tempered by anticipation. A 1-2-2 start has alternately been decent but disappointing (Tampa Bay), abjectly miserable (New Jersey), utterly embarrassing (Ottawa, in a home attendance “sit-anywhere-you-want-to, hell-nobody’s-here” Internet/Twitter mess), and good-but-could’ve-been-better (win over Buffalo, shootout loss to Washington). It’s just a five-game snippet, but something can be and has been learned in that time. The defense is better than expected. The Cats gave up five goals against the Devils, but throw those out (I know, they all count) and the defense has allowed just five goals in four games, excluding the shootout marker. Of course, a large part of that lies with Roberto Luongo, who blanked Buffalo for coach Gerard Gallant’s first win, and Al Montoya, who has been exceptional in both appearances, though he failed in the shootout against the Caps. Granted two of those wins are against mediocre Ottawa and awful Buffalo clubs, but Tampa Bay and Washington are likely playoff teams. This defense should keep Florida in many close games. The top six can’t be any worse. The top two lines of Aleksander Barkov, Jussi Jokinen, Brad Boyes, Nick Bjugstad, Jonathan Huberdeau and Scottie Upshall have combined for exactly four points, and only two – Huberdeau and Boyes – have goals. Worst still, top centers Barkov and Bjugstad are scoreless, as is Jokinen, the club’s major offensive acquisition in the offseason. Jokinen, who has shown some nice passing, was the lone missed shot in the shootout in DC. No team wins in the NHL consistently without production from its top six. Willie Mitchell has been well worth the money. The 2-time Stanley Cup winner has been a solid addition to the blue line, adding a calming presence and making all the small plays necessary of a player who has competed in over 900 NHL games. He’s also served as a fine replacement for Ed Jovanovski, another defenseman who was the previous captain. Another trait the two blueliners share: They will speak at length – at incredibly fantastic length – about their play and the state of the game or team. Mitchell’s value will continue to increase as strengthens relationships with his defensive unit and learns his teammates’ characteristics. A great stabilizing, experienced addition by GM Dale Tallon. Brandon Pirri must play. A team that struggles so mightily to score and appears goal-challenged most of the time cannot – simply can’t — repeatedly scratch the one player on the club who can snipe a bit. Shoot first instead of pass? That’s Pirri. One-time a pass, an amazing feat for this group? That too is Pirri. Win draws, push the play forward and put the puck on net? Pirri. Clearly, he has some faults that Gallant doesn’t like. At the Philadelphia draft, one Western Conference beat writer told me Pirri felt like he deserved more playing time in Chicago’s top six and was upset he wasn’t getting it, so maybe that’s why he was expendable to the talented Blackhawks. However, the Cats need him and must have him in the lineup. Aaron Ekblad belongs here, as does Derek MacKenzie. Ekblad, the 18-year-old rookie and No. 1 overall pick, has transitioned well into the NHL and has shown a flare for offense. He’s defensively responsible, solid in all aspects of his game and likes to shoot the puck – just like he repeated to us in Philadelphia – and should be here for the long haul this season. MacKenzie, a fourth line scrapper, wins face-offs and is as gritty as a Burning Man Festival attendee after a week spent in the Nevada desert. He hits and hits and hits, and physicality is infectious along a team’s bench. Florida already appears to be a much more physical club than in previous years. A large part of that credit goes to the feisty MacKenzie. Also, the season is not over. The hockey world appeared bad after New Jersey humiliated Florida last weekend, but it’s equally bad or worse with other teams. Edmonton, a team loaded with top talent, has scored six more goals than Florida but is 0-4-1 and has one point. Buffalo is as bad and dismal as a horrible winter storm in western New York, and Carolina’s not much better. As for scoring deficiency, Winnipeg tallied one goal over a three-game stretch and has two in its last four games. Plenty of hockey remains in this season, but it’s up to Gallant and the real quality drafted talent – Bjugstad, Barkov and Huberdeau – plus high-dollar acquisitions like Dave Bolland and Jokinen to give Florida the offensive punch it needs and turn these close losses into wins.